When most people think of chiropractors, the first thing that comes to mind is back pain. However, chiropractic care can be used to treat a variety of conditions from joint pain to migraines. When a patient comes in with complaints of pain in the shoulder and restricted motion in the joint, one possible diagnosis may be acromicioclavicular (AC) joint injury. While it is often an injury that is common among athletes, it can happen to anyone. Fortunately, chiropractic is a very effective treatment. What is an acromioclavicular joint injury? There are two bones, the clavicle and acromion, that make up the AC joint. Four ligaments hold the joint together. When those ligaments are strained to stressed, it results in an AC joint injury, often causing at least some joint separation. AC injuries fall into one of two categories: overuse and traumatic. Overuse injury occurs over a period of time and is caused by excessive stress on the joint that is repeated or consistent. This causes damage to the cartilage and can lead to AC joint arthritis. 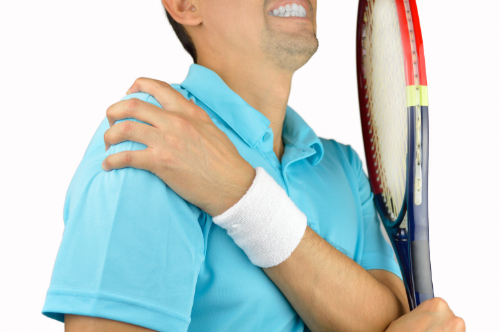 Traumatic injury occurs when the damaged ligaments cause a disruption of the joint called a shoulder separation. This is different from a shoulder dislocation which involves the actual ball and socket shoulder joint. What causes acromioclavicular joint injury? The cause of an AC joint injury depends on the type of injury. Overuse AC joint injuries is caused by overuse and is commonly seen in people who perform tasks that involve lifting heavy weight (including military or bench presses) or that perform physical labor that involves often stretching their arms over their heads. Traumatic AC joint injuries are often caused by a fall. The person may fall and land on their shoulder or fall on their hand then they put it out to brace their fall. It is often seen in cyclists who are involved in crashes, football players when they are tackles, or a laborer who falls from a high place, such as a ladder. These injuries are graded from mild to severe, depending on how much the separation there is in the joint. What are the symptoms of acromioclavicular joint pain? What are the treatments for acromioclavicular joint pain? Mild cases of traumatic AC joint injuries are often treated with physical therapy and chiropractic. Ice, rest, and immobilization can also be used to manage the pain. Overuse AC joint injuries can also be treated with immobilization and ice as well as physical therapy and chiropractic. More severe cases may require surgery. Doctors may prescribe muscle relaxants, pain medication, or NSAIDs to help manage the pain. Is chiropractic for acromioclavicular joint pain effective? Chiropractic has been proven to be very effective for AC joint pain. The chiropractor performs what is called an AC adjustment which involves manipulation of the shoulder. While it can be a little uncomfortable for the patient, it is one of the best ways to quickly decrease the pain. After the procedure, the chiropractor may recommend icing the area to minimize or prevent swelling and pain. Regular chiropractic care can ensure continued mobility and continued decrease in pain.